Hot rod enthusiasts looking for a car getaway can find one near home at the Hollywood Car Museum at Hot Rod City, 5115 Dean Martin Drive. 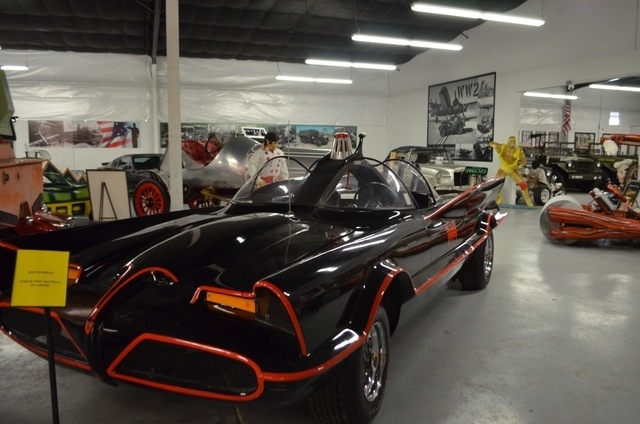 This Museum for cars from films and TV shows features more than 100 vehicles, ranging from original Batmobiles and James Bond cars to quirky cartoon and concept cars. Hollywood Car Museum founder Michael Dezer bought the Hot Rod City land with the intention of developing high-rise condominiums, much like the developments that made him a fortune in Florida. But when the bottom fell out of the real estate market, Dezer decided to dedicate the property to his passion: cars. Most of the complex is packed with automotive-related tradesmen: mechanics, painters, automotive fabricators and more. About three years ago, the museum concept was launched. Exhibits at the museum include a host of original Hollywood vehicles and reproductions. “The Fast and the Furious” stunt cars include a racer driven by Paul Walker. “When he got killed, a lot of people came over here and brought candles, teddy bears and signs,” Levesque said. The reproduction of the Clampetts’ truck from “The Beverly Hillbillies” sits alongside the Bonnie and Clyde death car. While some reproductions aren’t discernibly tributes, others, such as Doc Hudson from “Cars,” are. A Hot Rod City Hangout Car Show is scheduled at the museum from noon to 4:30 p.m. March 1. The museum is open from 10 a.m. to 5 p.m. daily. Admission is $20 for adults and free for children younger than 16. For more information, visit hotrodcitylasvegas.com or call 702-331-6400.